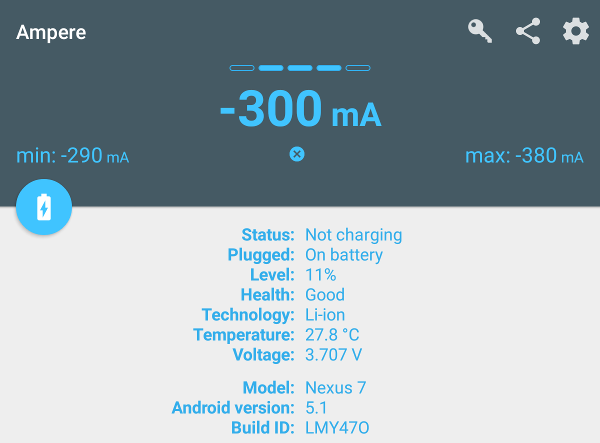 However Ampere works flawlessly on most of the devices, there are some with faulty firmware. One typical problem is when a device reports "Not Charging" state instead of the "Discharging" state. This is very unfortunate, because Ampere was designed to measure the current only in the "Charging" and "Discharging" states. Even the famous Nexus 7 2013 was plagued with this problem too and therefore it was time to do something. The solution is the new setting option "Enhanced Measurement". If it is switched on then Ampere tries to measure the discharging current also in the problematic "Not Charging" state. In this way Ampere is able to measure the discharging current also in the "Not Charging" state. 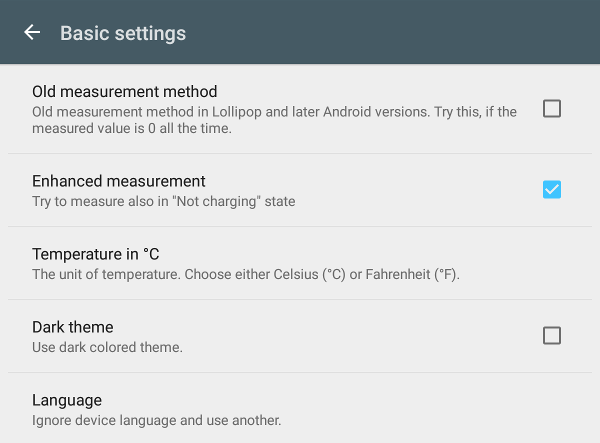 If it doesn't work then please look whether your device has more than one measurement interface (Basic Settings / Measurement interface) and try to select an other interface. The new option "Enhanced measurement" is first available in Ampere v1.44.